Heat oven to 350°F (325°F for dark or nonstick pan). Spray bottom only of 13x9-inch pan with cooking spray. Make brownie batter as directed on box, and spread in bottom of pan. Drizzle sweetened condensed milk over batter, leaving 1/2-inch border around edge. Bake 26 to 28 minutes or until toothpick inserted in center comes out clean. Immediately top with toffee bits. Cool 30 minutes on cooling rack. Refrigerate about 2 hours or until cooled completely. When ready to serve, in small microwavable bowl, microwave chocolate fudge topping uncovered on High 10 to 20 seconds or until thin enough to drizzle. 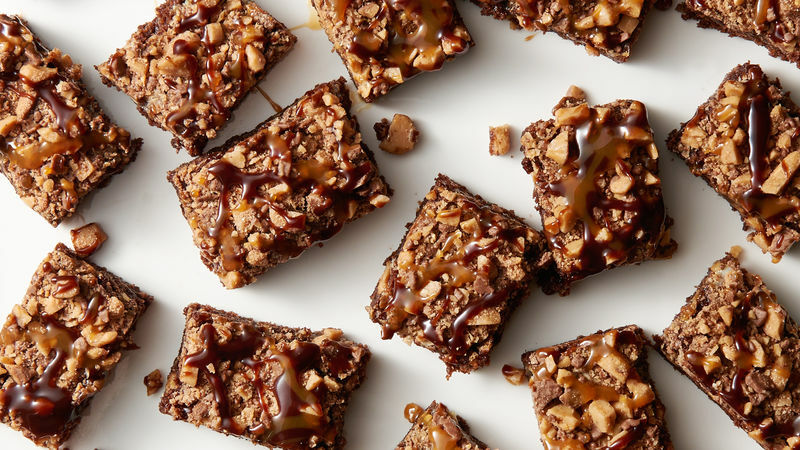 Drizzle fudge and caramel toppings over bars. Cut into 8 rows by 4 rows. Store in airtight container in refrigerator. Chocolate fudge topping is almost always too thick to drizzle at room temperature, so we recommend heating it before drizzling. Caramel toppings vary greatly in consistency, but if yours is too thick to drizzle over the bars, warm it in microwave on High in 15-second intervals until it reaches desired consistency. Placing the toffee bits on the bars right out of the oven while they’re still hot allows them to melt slightly and adhere better to the bars.